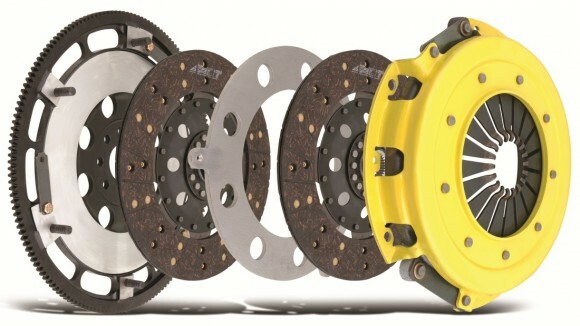 Advanced Clutch Technology (ACT) is pleased to introduce its new twin-disc kits for the 2010 Chevrolet Camaro SS equipped with 6.2L LS3 V8 engine. The ACT Xtreme twin-disc kit offers Camaro SS enthusiasts a wide range of street-friendly to race-ready kits with torque capacities from 850-1450 lbs/ft of torque. All kits offer discs that have twice the surface area and wear for high heat capacity and long life, and include our proprietary precision ground floater lift system, which allows for adjustment to compensate for wear. Each kit offers a choice of three different clamp load designs for unparalleled performance and moderate pedal effort. Users also have the option of choosing disc combinations that feature high torque capacities along with smooth consistent engagement. All ACT 2010 Camaro SS Xtreme twin-disc kits include a CNC-machined and dynamically balanced flywheel to ensure smooth, trouble free installation and operation. ACT’s Xtreme twin disc kits are a perfect complement to an already expansive catalog of over 1200 performance clutch kits and components for more than 700 different applications. ACT Clutches deliver the maximum holding power by applying a series of sound engineering advancements to new (not rebuilt) components which maximizes load and reduces flex. The result is maximum torque capacity, long life and clean, fast shifting.